Urinary tract obstruction in the presence of pyelonephritis may lead to the collection of white blood cells (WBCs), bacteria, and debris in the collecting system, which may subsequently result in pyonephrosis. In this situation, with the accompanying "pus under pressure," patients may deteriorate rapidly and become septic. Thus, early recognition and treatment of acute infections of the kidney, especially in patients with suspected urinary tract obstruction, are of paramount importance. Risk factors for pyonephrosis include immunosuppression due to medications (eg, steroids), disease (eg, diabetes mellitus, acquired immunodeficiency syndrome [AIDS]), and any anatomic urinary tract obstruction (eg, stones, tumors, ureteropelvic junction [UPJ] obstruction, pelvic kidney, horseshoe kidney). Pyonephrosis is uncommon in adults and rare in children, and it is thought to be extremely rare in neonates. However, pyonephrosis has been reported in several neonates  and adults, making it clear that the condition may develop in any age group. In pyonephrosis, purulent exudate—consisting of inflammatory cells, infectious organisms, and a necrotic, sloughed urothelium—collects in a hydronephrotic collecting system and forms an abscess. The exudate becomes walled off and protected from the body's natural immune system and from antibiotics. If not recognized and treated promptly, this infectious process may progress, often resulting in clinical deterioration of the patient with urosepsis, which can occur swiftly. With the advent of ultrasonography and computed tomography (CT) scanning, drainage—either percutaneously or retrograde with a ureteral stent—has become the mainstay of treatment. [5, 6, 7] Drainage has low morbidity and mortality rates and an excellent outcome. Drainage guided by CT scan or ultrasonography significantly decreases the need for nephrectomy, resulting in renal preservation. Immunocompromised patients and those who are treated with long-term antibiotics are at an increased risk for fungal infections. When fungus balls are present, they may obstruct the renal pelvis or the ureter, resulting in pyonephrosis. Xanthogranulomatous pyelonephritis, a clinical condition consisting of upper renal calculus and infection, has been reported to progress to pyonephrosis when obstruction is present. 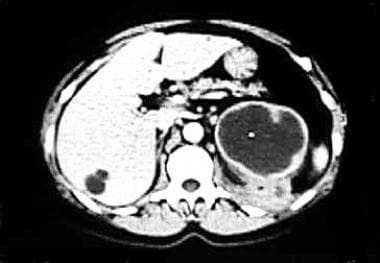 Several case reports indicate that obstruction from tumors, such as in transitional cell carcinoma, may also cause pyonephrosis. [15, 16] The disease process of pyonephrosis consists of 2 parts: infection and infection. The prognosis of pyonephrosis is good in most patients who receive prompt diagnosis and treatment. Most infectious processes resolve within 24-48 hours and significantly improve after either nephrostomy or retrograde stent drainage of the infection. If pyonephrosis is recognized and treated promptly, recovery of the affected renal unit is rapid. Long-term complications are rare when pyonephrosis is managed promptly; however, injury to the functional renal unit, abscesses, fistulas, and scarring may occur when definitive therapy is delayed. Patients with pyonephrosis that is not recognized early may rapidly deteriorate and develop septic shock. In addition to the morbidity and mortality associated with septic shock, potential complications of delayed diagnosis and treatment of pyonephrosis include irreversible damage to the kidneys, with the possible need for nephrectomy. Even in the modern era of antibiotics, adequately controlling an overwhelming infection in an obstructed renal unit without surgical intervention may be impossible. If the diagnosis is delayed, unduly prolonged illness and death may result. Sepsis is the most common complication in the perioperative period when treatment is delayed. Generalized peritonitis can result from a rupture of the pyonephrotic kidney. In 1996, Hendaoui et al reported the first case of a splenic abscess that developed from a ruptured pyonephrosis after the development of generalized peritonitis. Other occurrences of intraperitoneal and retroperitoneal spontaneous rupture have been reported by Sugiura et al, in 2004;  Chung et al, in 2009;  and Quaresima et al, in 2011,  making it possibly much more common than originally thought. Fistulas may develop and can be associated with peritonitis. Renocolonic, renoduodenal,  and renocutaneous fistulas are the most common; therefore, suspect these in patients who manifest continued electrolyte disorders, diarrhea, and recurrent urinary tract infections after resolution of pyonephrosis. Other rare complications include pneumoperitoneum from lithogenic pyonephrosis, nephrobronchial fistula, renal vein thrombosis, psoas abscess and/or perinephric abscess, and rhabdomyolysis. Delay in diagnosis and treatment may result in a loss of renal function from parenchymal damage. A urine culture of the fluid above the obstruction must be obtained in order to guide antibiotic therapy. A culture specimen may be obtained from an open-ended catheter that has been advanced above the obstruction during stent placement. Cultures should also be obtained from the percutaneous tube at the time of nephrostomy placement if this course of action is chosen. Leukocytosis and bacteruria may be present; however, they are not specific for pyonephrosis and may be due to other causes (eg, pyelonephritis, uncomplicated urinary tract infections). Pyuria, while often present in pyonephrosis, is nonspecific. Bacteruria, fever, pain, and leukocytosis can be absent in 30% of patients with pyonephrosis. Aspiration of the collecting system with CT scan or ultrasonographic guidance, with Gram stain and culture of the fluid, provides a definitive diagnosis of pyonephrosis. Sending the culture for aerobic, anaerobic, and fungal pathogens is important. If clinically indicated, perform acid-fast stain and send cultures for tuberculosis testing. Sonogram of the kidney showing hydronephrosis with the presence of debris and layering of low-level echogenic foci consistent with pyonephrosis. Echogenic gas is rarely demonstrated. Intrarenal gas appears as "dirty shadows." 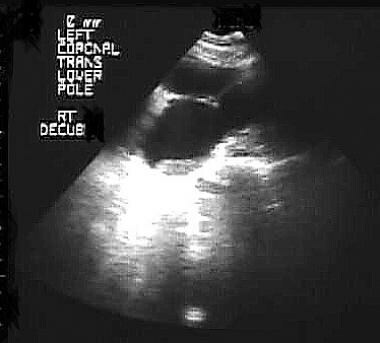 If echogenic gas is present, assume that the patient has a severe infection and possible renal injury suggestive of emphysematous pyelonephritis. Ultrasonography does have drawbacks. [37, 38] For example, it may not always differentiate hydronephrosis from early pyonephrosis. In these cases, consider conducting an ultrasonographically guided aspiration of the hydronephrotic fluid for microscopic examination to establish the diagnosis. Computed tomography scan with images through the kidneys showing dilation of the collecting system, increased renal pelvic wall thickness, and the presence of renal pelvic debris. Parenchymal and perirenal findings, such as perirenal fat stranding. The presence of pyonephrosis during episodes of acute pyelonephritis has been described as a negative prognostic indicator for patients who do not respond appropriately to treatment for the pyelonephritis. Kim et al developed a scoring system for CT scanning of patients admitted with acute pyelonephritis that includes the presence or absence of pyonephrosis. Increased scores on admission indicate more severe illness, thus possibly requiring surgical treatment or other intervention for the infected hydronephrosis. This study is seldom helpful in the diagnosis of pyonephrosis. The decreased function of the affected kidney that accompanies active infection typically prevents visualization on contrast studies. A method to distinguish pyonephrosis from noninfected hydronephrosis has been proposed based on diffusion MRI. In this method, pyonephrosis is correlated with marked, hyperintense signals in the collecting system (which correspond to the pus in the system), while the hydronephrotic kidney without pus is hypointense. Renal nuclear scanning may be helpful when a kidney is believed to be nonfunctional on any imaging study during the acute phase of pyonephrosis. Performing follow-up nuclear imaging studies is prudent after resolution of the infection to establish the function of the involved kidney. If a kidney is proven to be nonfunctional after resolution of infection and treatment of the etiology of the obstruction, then nephrectomy may be indicated to prevent further episodes of pyonephrosis. This test may be extremely helpful in determining the etiology of the obstruction associated with pyonephrosis and in planning further treatment strategies. As with any invasive procedure, nephrostography should be delayed until the patient is stable, on antibiotics, and afebrile for 1-2 weeks after placement of a nephrostomy tube. When a definitive anatomic abnormality, such as the presence of a stone or tumor, cannot be determined, further imaging studies and tests may be needed to establish the etiology of the pyonephrosis. These tests may include voiding cystourethrography, to exclude vesicoureteral reflux; multichannel urodynamics, to establish a possible neurogenic bladder with urine stasis; and serial renal ultrasonography, to document resolution of hydronephrosis after treatment. The treatment of pyonephrosis has changed dramatically over the years. Prior to the 1980s, emergency surgical excision with nephrectomy was the standard of care. However, this was associated with a high morbidity and complication rate, including sepsis, wound infections, peritonitis, and fistulas. Initially, treat patients with appropriate intravenous antibiotics consisting of an aminoglycoside (gentamicin) and gram-positive coverage (ampicillin), prior to instrumentation. Depending on the clinical situation, additional anaerobic coverage with clindamycin may be needed. Be cognizant of the fact that patients may have fungal infection or tuberculosis. The use of antifungal or antibacterial agents is predicated on culture results. Many patients are septic and may require aggressive fluid resuscitation with crystalloids. Pressor support (with dopamine) may be needed to maintain adequate blood pressure and hemodynamics. Disadvantages of retrograde decompression include lack of antegrade access for radiologic studies, a smaller-caliber urinary drainage catheter than with percutaneous access, increased irritative urinary symptoms, an inability to administer medications such as antibiotics via nephrostomy tube, and limitation of percutaneous chemolysis that may cause dissolution of any stones. To maximize drainage, a urethral catheter should be left in place after stent placement. A retrograde approach usually requires a general anesthetic, and bypassing the obstruction may not be possible in some patients. In addition, pyelovenous, pyelolymphatic, and pyelosinus backflow of infected urine into the systemic circulatory system is always a risk with retrograde manipulation. This may result in iatrogenic sepsis and patient decompensation. Definitive management of stones and obstruction with ureteroscopy, lithotripsy, or endopyelotomy is contraindicated in the immediate treatment of patients with pyonephrosis. If retrograde stent placement is chosen, the surgeon should attempt to minimize instrumentation and retrograde pyelography as much as possible and should decompress the obstruction with minimal trauma to the urinary tract. Reports exist of ureteroscopic instrumentation involving stone and obstruction removal during active infection. Although performed at some institutions, the authors do not recommend this practice, because it may result in sepsis and worsening infection. Antegrade treatment with percutaneous nephrostomy tube placement is indicated in any patient with hemodynamic instability or sepsis and when retrograde instrumentation may cause an inappropriate delay in treatment or unnecessary trauma to the genitourinary tract. Disadvantages to nephrostomy tube placement include the possibility of renal trauma and difficulties in placing the tube in some patients because of body habitus or mild hydronephrosis that makes localization with ultrasonography difficult. In the management of pyonephrosis, nephrostomy tubes should never be placed transpleurally. This avoids pneumothorax, pleural infections, and empyema formation. Percutaneous suprapubic tube placement guided by ultrasonography or radiography can be helpful in selected patients with urosepsis due to bladder outlet obstruction when a Foley catheter cannot be easily placed. Consider the following 2-stage treatment for patients with pyonephrosis. Perform retrograde stent placement. Use percutaneous CT scan- or ultrasonography-guided nephrostomy. The posterior calyx should be entered from an oblique posterolateral approach in the posterior axillary line, 2-4cm below the 12th rib. This avoids the pleura, colon, liver, and spleen and is least likely to result in hemorrhage. Initial entry is made with a 20-gauge Chiba or 18-gauge sheath needle. The tract is then dilated using the Seldinger technique, and an 8F-14F nephrostomy tube is placed and connected to a closed-system drainage bag. The infectious process often resolves within 24-48 hours following drainage, and the patient may improve significantly once this occurs. Eliminate the obstruction by removing the stone, fungus ball, or tumor 1-2 weeks after percutaneous drainage or stent placement. Accomplish this with the use of electrohydraulic lithotripsy, laser lithotripsy,  percutaneous nephrolithotomy, extracorporeal shockwave lithotripsy, endopyelotomy, transurethral resection, or open surgical procedures. All of these are based on the type of obstruction and clinical situation. In patients with uric acid stones and fungus balls, antegrade irrigation with alkaline fluids and antifungals through the nephrostomy tube may be needed prior to surgical intervention. While retrograde placement of a stent will not likely increase the risk of septicemia,  it is still contraindicated in unstable patients with preexisting sepsis. In these situations, proceeding directly with percutaneous placement of a nephrostomy tube is best for maximal decompression of the infected system. Retrograde stent placement is relatively contraindicated in patients with known impacted and obstructing upper tract stones that may ultimately need percutaneous treatment or in those with fungus balls that may need additional therapy with antegrade irrigation and instrumentation. Treatment of infections occurring from pyelonephritis  and pyonephrosis is changing rapidly and dramatically. The persistent use of broad-spectrum antibiotics, an increase in the population of immunocompromised patients (eg, patients with AIDS, patients undergoing chemotherapy), and the evolution of multiple drug–resistant bacteria complicate the picture. Rare organisms, multiple-organism infections, and Candida species are now commonly associated with infected calculi. Antegrade percutaneous nephrostomy placement allows the drainage of purulent material and the antegrade infusion of antifungal medication and antibiotics to adequately treat these infections. Retrograde stent placement does not allow this form of therapy; therefore, many experts stress the importance of nephrostomy drainage rather than retrograde transurethral drainage for pyonephrosis. The authors currently prefer retrograde stent drainage after loading the patient with broad-spectrum antibiotics, reserving antegrade drainage for patients who may require further intervention, as previously discussed. The need for nephrectomy after percutaneous nephrostomy drainage and antibiotic treatment is debated. Some advocate the need for removal if the source of obstruction is not clearly identified. This can help to exclude the presence of a malignant etiology for the obstruction, such as transitional cell carcinoma of the renal pelvis. Nonresponsiveness to therapy and progression of disease after percutaneous drainage are additional indications for nephrectomy; however, current technology reflects that preserving the maximal number of renal units is prudent. St Lezin M, Hofmann R, Stoller ML. Pyonephrosis: diagnosis and treatment. Br J Urol. 1992 Oct. 70(4):360-3. [Medline]. Sharma S, Mohta A, Sharma P. Neonatal pyonephrosis--a case report. Int Urol Nephrol. 2004. 36(3):313-5. [Medline]. Perimenis P. Pyonephrosis and renal abscess associated with kidney tumours. Br J Urol. 1991 Nov. 68(5):463-5. [Medline]. Wah TM, Weston MJ, Irving HC. Lower moiety pelvic-ureteric junction obstruction (PUJO) of the duplex kidney presenting with pyonephrosis in adults. Br J Radiol. 2003 Dec. 76(912):909-12. [Medline]. Ramsey S, Robertson A, Ablett MJ, Meddings RN, Hollins GW, Little B. Evidence-based drainage of infected hydronephrosis secondary to ureteric calculi. J Endourol. 2010 Feb. 24(2):185-9. [Medline]. Barbaric ZL, Hall T, Cochran ST, et al. Percutaneous nephrostomy: placement under CT and fluoroscopy guidance. AJR Am J Roentgenol. 1997 Jul. 169(1):151-5. [Medline]. Camunez F, Echenagusia A, Prieto ML, et al. Percutaneous nephrostomy in pyonephrosis. Urol Radiol. 1989. 11(2):77-81. [Medline]. Jimenez JF, Lopez Pacios MA, Llamazares G, et al. Treatment of pyonephrosis: a comparative study. J Urol. 1978 Sep. 120(3):287-9. [Medline]. Pearle MS, Pierce HL, Miller GL, et al. Optimal method of urgent decompression of the collecting system for obstruction and infection due to ureteral calculi. J Urol. 1998 Oct. 160(4):1260-4. [Medline]. Duarte RJ, Mitre AI, Chambô JL, Arap MA, Srougi M. Laparoscopic nephrectomy outside gerota fascia for management of inflammatory kidney. J Endourol. 2008 Apr. 22(4):681-6. [Medline]. Roberts JA. Pyelonephritis, cortical abscess, and perinephric abscess. Urol Clin North Am. 1986 Nov. 13(4):637-45. [Medline]. Sugiura S, Ishioka J, Chiba K, et al. [A case report of splenic abscesses due to pyonephrosis]. Hinyokika Kiyo. 2004 Apr. 50(4):265-7. [Medline]. Hendaoui MS, Abed A, M'Saad W, et al. [A rare complication of renal lithiasis: peritonitis and splenic abscess caused by rupture of pyonephrosis]. J Urol (Paris). 1996. 102(3):130-3. [Medline]. Jain KA. Transitional cell carcinoma of the renal pelvis presenting as pyonephrosis. J Ultrasound Med. 2007 Jul. 26(7):971-5. [Medline]. Chung SD, Lai MK, Chueh SC, Wang SM, Yu HJ. An unusual cause of pyonephrosis and intra-peritoneal abscess: ureteral urothelial carcinoma. Int J Infect Dis. 2009 Jan. 13(1):e39-40. [Medline]. Baraboutis IG, Koukoulaki M, Belesiotou H, Platsouka E, Papastamopoulos V, Kontothanasis D, et al. Community-acquired methicillin-resistant Staphylococcus aureus as a cause of rapidly progressing pyelonephritis with pyonephrosis, necessitating emergent nephrectomy. Am J Med Sci. 2009 Sep. 338(3):233-5. [Medline]. Bal A, Aulakh R, Mohan H, Bawa AS. Mucinous adenocarcinoma of the renal pelvis presenting as pyonephrosis: a case report. Indian J Pathol Microbiol. 2007 Apr. 50(2):336-7. [Medline]. Martín MS, García-Ripoll TJ, Ruíz SA, Rodríguez GV, Ferro RJ, del Busto FE. [Ectopic ureter as cause of pyonephrosis and urinary incontinence]. Actas Urol Esp. 2008 Feb. 32(2):256-60. [Medline]. Schneider K, Helmig FJ, Eife R, et al. Pyonephrosis in childhood--is ultrasound sufficient for diagnosis?. Pediatr Radiol. 1989. 19(5):302-7. [Medline]. Quaresima S, Manzelli A, Ricciardi E, Petrou A, Brennan N, Mauriello A, et al. Spontaneous intraperitoneal rupture of pyonephrosis in a patient with unknown kidney carcinosarcoma: a case report. World J Surg Oncol. 2011 Apr 12. 9:39. [Medline]. [Full Text]. Kim CJ, Kato K, Yoshiki T, et al. [Intractable duodenocutaneous fistula after nephrectomy for stone pyonephrosis: report of a case]. Hinyokika Kiyo. 2003 Sep. 49(9):547-50. [Medline]. Greenstein A, Kaver I, Chen J, et al. Does preoperative nephrostomy increase the incidence of wound infection after nephrectomy?. Urology. 1999 Jan. 53(1):50-2. [Medline]. Wu TT, Lee YH, Tzeng WS, et al. The role of C-reactive protein and erythrocyte sedimentation rate in the diagnosis of infected hydronephrosis and pyonephrosis. J Urol. 1994 Jul. 152(1):26-8. [Medline]. Angulo JC, Gaspar MJ, Rodríguez N, García-Tello A, Torres G, Núñez C. The value of C-reactive protein determination in patients with renal colic to decide urgent urinary diversion. Urology. 2010 Aug. 76(2):301-6. [Medline]. Shaikh N, Borrell JL, Evron J, Leeflang MM. Procalcitonin, C-reactive protein, and erythrocyte sedimentation rate for the diagnosis of acute pyelonephritis in children. Cochrane Database Syst Rev. 2015 Jan 20. 1:CD009185. [Medline]. Lertdumrongluk K, Thongmee T, Kerr SJ, Theamboonlers A, Poovorawan Y, Rianthavorn P. Diagnostic accuracy of urine heparin binding protein for pediatric acute pyelonephritis. Eur J Pediatr. 2015 Jan. 174 (1):43-8. [Medline]. Baumgarten DA, Baumgartner BR. Imaging and radiologic management of upper urinary tract infections. Urol Clin North Am. 1997 Aug. 24(3):545-69. [Medline]. Demertzis J, Menias CO. State of the art: imaging of renal infections. Emerg Radiol. 2007 Apr. 14(1):13-22. [Medline]. Colemen BG, Arger PH, Mulhern CB Jr, et al. Pyonephrosis: sonography in the diagnosis and management. AJR Am J Roentgenol. 1981 Nov. 137(5):939-43. [Medline]. Subramanyam BR, Raghavendra BN, Bosniak MA, et al. Sonography of pyonephrosis: a prospective study. AJR Am J Roentgenol. 1983 May. 140(5):991-3. [Medline]. van Nieuwkoop C, Hoppe BP, Bonten TN, Van't Wout JW, Aarts NJ, Mertens BJ, et al. Predicting the need for radiologic imaging in adults with febrile urinary tract infection. Clin Infect Dis. 2010 Dec 1. 51(11):1266-72. [Medline]. Jeffrey RB, Laing FC, Wing VW, et al. Sensitivity of sonography in pyonephrosis: a reevaluation. AJR Am J Roentgenol. 1985 Jan. 144(1):71-3. [Medline]. Vourganti S, Agarwal PK, Bodner DR, Dogra VS. Ultrasonographic evaluation of renal infections. Radiol Clin North Am. 2006 Nov. 44(6):763-75. [Medline]. Choi J, Jang J, Choi H, Kim H, Yoon J. Ultrasonographic features of pyonephrosis in dogs. Vet Radiol Ultrasound. 2010 Sep-Oct. 51(5):548-53. [Medline]. Vourganti S, Agarwal P, Bodner D, Dogra V. Ultrasonographic Evaluation of Renal Infections. Ultrasound Clin. 2010. 5:1-13. Stojadinovic M, Micic S, Milovanovic D. Ultrasonographic and computed tomography findings in renal suppurations: performance indicators and risks for diagnostic failure. Urol Int. 2008. 80(4):389-97. [Medline]. Wyatt SH, Urban BA, Fishman EK. Spiral CT of the kidneys: role in characterization of renal disease. Part I: Nonneoplastic disease. Crit Rev Diagn Imaging. 1995. 36(1):1-37. [Medline]. Joudi FN, Kuehn DM, Williams RD. Maximizing clinical information obtained by CT. Urol Clin North Am. 2006 Aug. 33(3):287-300. [Medline]. Fultz PJ, Hampton WR, Totterman SM, et al. Computed tomography of pyonephrosis. Abdom Imaging. 1993. 18(1):82-7. [Medline]. Kim SH, Kim YW, Lee HJ. Serious acute pyelonephritis: a predictive score for evaluation of deterioration of treatment based on clinical and radiologic findings using CT. Acta Radiol. 2012 Mar 1. 53(2):233-8. [Medline]. Pedrosa I, Rofsky NM. MR imaging in abdominal emergencies. Radiol Clin North Am. 2003 Nov. 41(6):1243-73. [Medline]. Geoghegan T, Govender P, Torreggiani WC. MR urography depiction of fluid-debris levels: a sign of pyonephrosis. AJR Am J Roentgenol. 2005 Aug. 185(2):560. [Medline]. Cova M, Squillaci E, Stacul F, et al. Diffusion-weighted MRI in the evaluation of renal lesions: preliminary results. Br J Radiol. 2004 Oct. 77(922):851-7. [Medline]. Tran MH, Sakow NK, Dorey JH. Detection of pyonephrosis using dual isotope imaging technique. Clin Nucl Med. 1994 Feb. 19(2):161-2. [Medline]. Wagenlehner FM, Sobel JD, Newell P, Armstrong J, Huang X, Stone GG, et al. Ceftazidime-avibactam Versus Doripenem for the Treatment of Complicated Urinary Tract Infections, Including Acute Pyelonephritis: RECAPTURE, a Phase 3 Randomized Trial Program. Clin Infect Dis. 2016 Sep 15. 63 (6):754-62. [Medline]. [Full Text]. Xin J, Huang SD, Yu LX, et al. [Pneumatic lithotripsy under ureteroscope for pyonephrosis due to calculus obstruction.]. Di Yi Jun Yi Da Xue Xue Bao. 2004 Oct. 24(10):1199-200. [Medline]. Disclosure: Received grant/research funds from American medical systems for research.